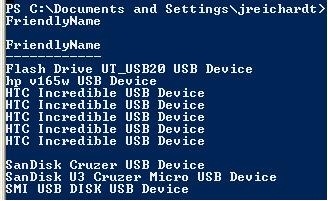 This post will describe how to dig into a Windows system and check to see USB devices that have been connected to a computer locally. This can be interesting, for example, if you are interested in monitoring what kind of devices are being connected and identifying potentially dangerous devices that are being attached to a system. Just expand the tab to see which devices are listed here. Then drill down into a particular device in this subtree to get information about the USB device. There should be a field named FriendlyName that you can check. The other (quicker) way to get this information is to use Powershell. Use the following command to quickly enumerate these devices. Here is a sample output. Much cleaner and much easier.